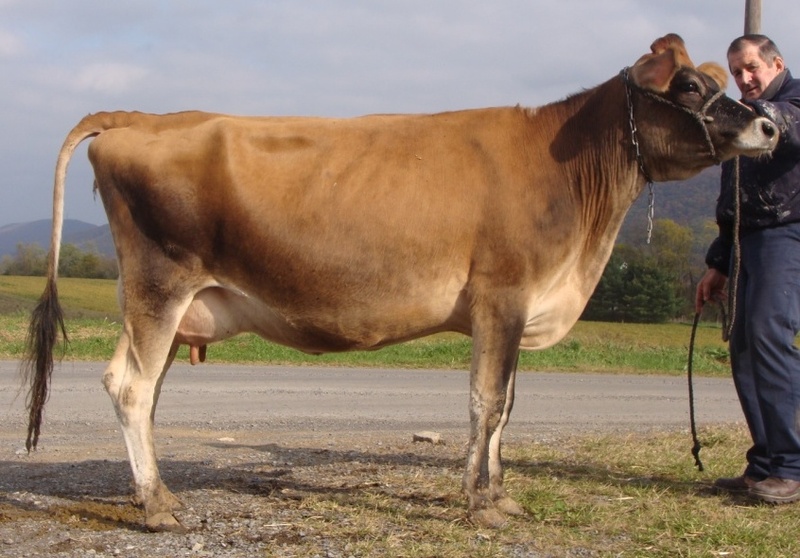 A dairy animal changes in body condition throughout different periods of her life. 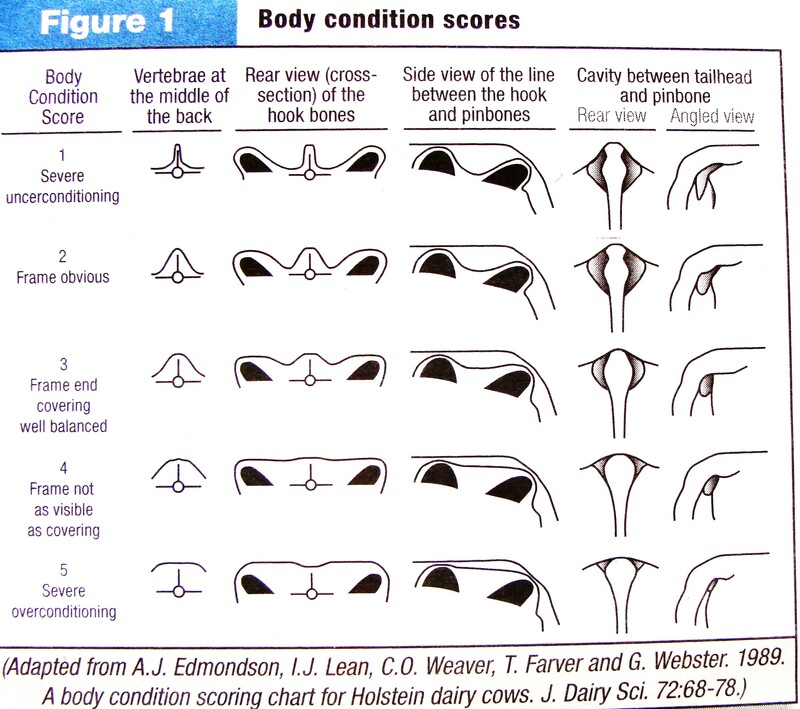 Body condition scoring rates a cow on a ONE to FIVE scale. ONE means the cow is severely, detrimentally thin. FIVE means the cow is over conditioned to the point of impacting her health. Your dairy animal should always be within a range of 2 to 4. 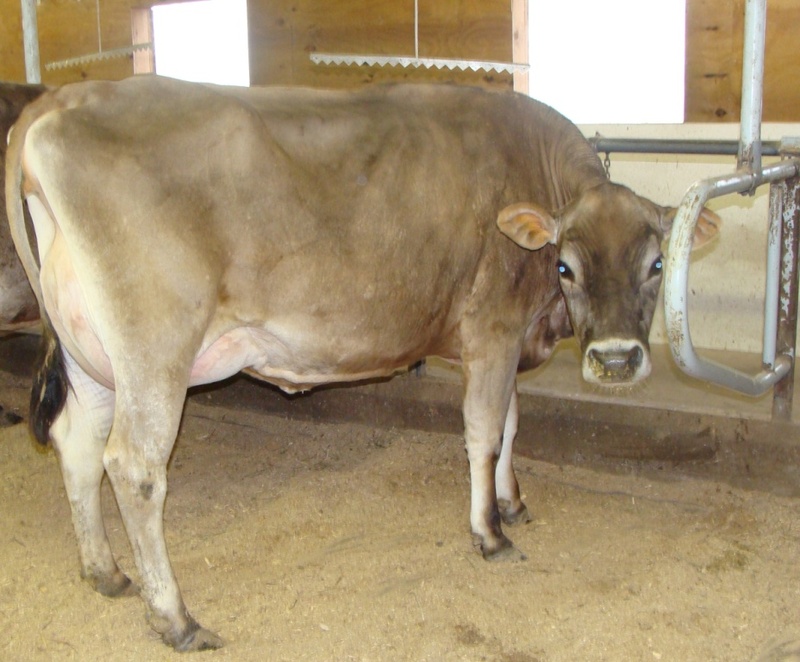 [Note, some charts offer different numbering systems, so always refer comparatively] The link below gives a good description and pictures of how cows look at each number score, and advises on how cows should look in different situations and how to keep your cow at the weight you want her. Make sure to evaluate your cow frequently, especially around calving time. Young Rosalie around a year old (below). Notice she has good flesh, but is not “chunky”: you can see slight definition of the ribs, her rear leg shows clean lines. If you were showing Rosalie at a fair (this picture was taken after a local fair, which is why she is body clipped) you would probably see other calves in her class a lot thinner. The modern show ring makes heifers to look like miniature cows without udders. Our philosphy is that heifers need to grow and develop, so limiting their feed and keeping them “skinny” is not to their best advantage. The choice is yours as to how you want to raise your heifers. Getting ready to calve. Notice extra flesh around the pin bones. She needs this extra energy and will “milk off” this fat in the next few months. 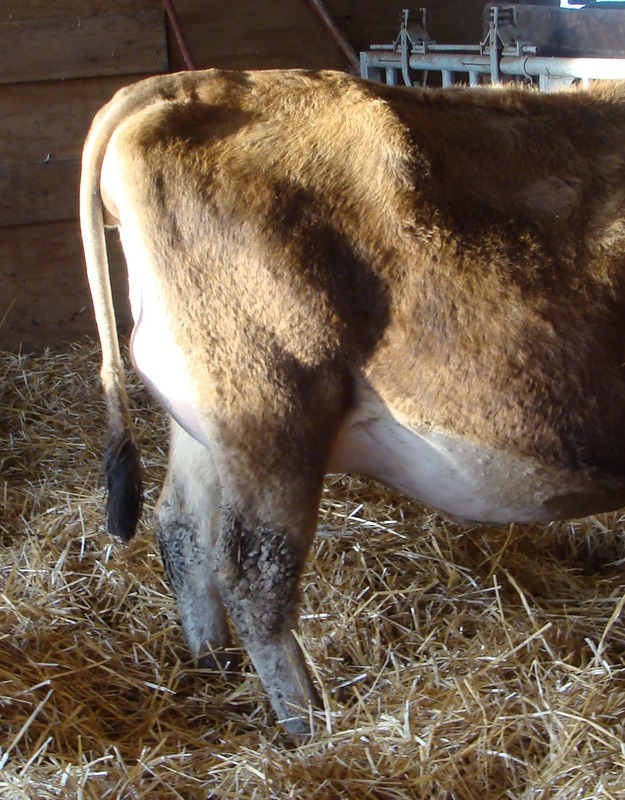 The shadow in front on her pin bones highlights the area of “ligaments” which you can see are starting to soften up in preparation for calving, which is still a few days away. Rosalie has freshened in this picture and is much thinner. She has milked off most of her extra fat, but has kept a little “cushioning” which is a good quality in a cow. 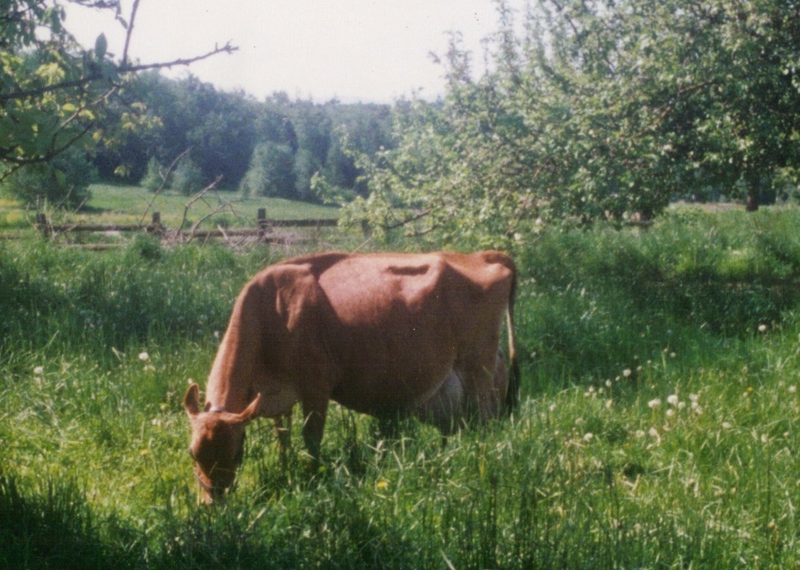 A cow needs to maintain a certain amount of body condition to stay in optimum health. 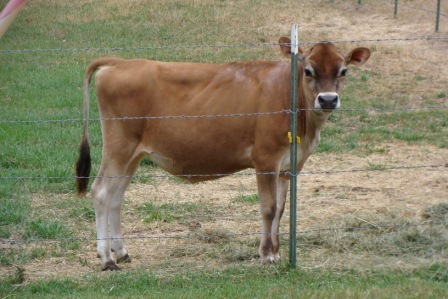 If too thin, a cow will more easily develop health and reproductive issues. Rosalie is now at the end of her lactation. she has put on more flesh, maybe a little more than she should have at this point! 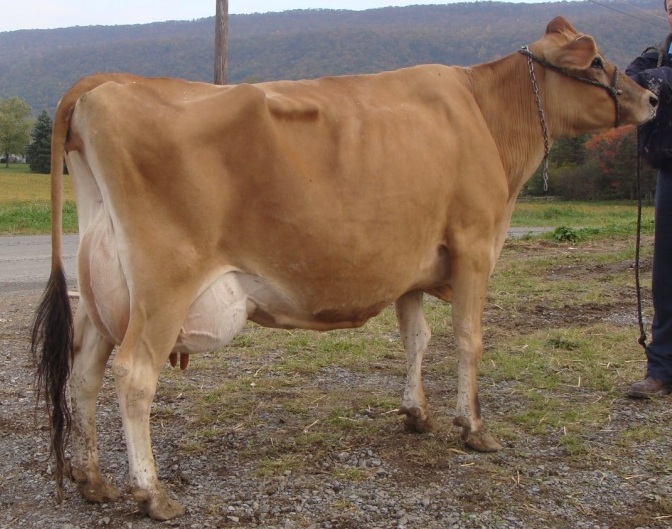 Her udder has “shrunk” because she is not milking as much. Soon, she will go dry and should maintain this same condition throughout her dry period. 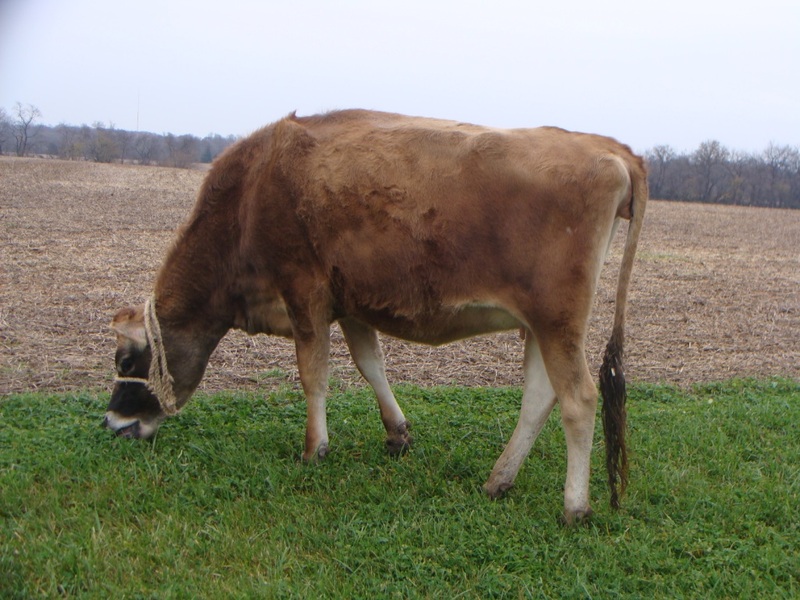 She needs nutrients to feed her calf, so never “scrimp” on feeding a dry cow. 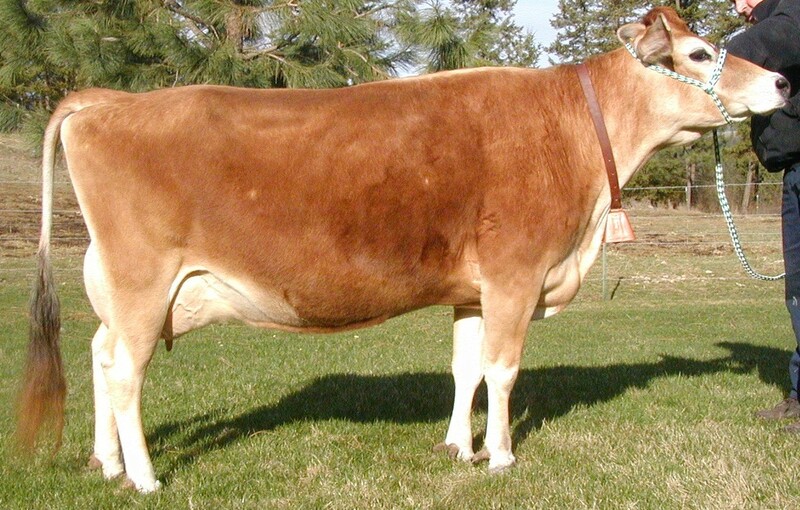 Keep in mind: A cow’s condition changes as she grows, matures, and in different stages of her lactation. Thank you: this is so helpful! It’s just what I was searching for, and helps reassure me that my Jersey cow is in fact in good condition. Also, I want to say that I’ve found several other of your posts very helpful–as a fairly new (1 year in) family cow milker, I appreciate your experience and information. 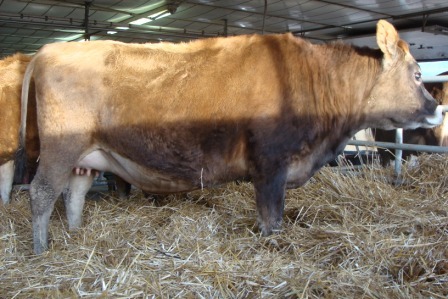 I purchased a bred cow (appears to be jersey/angus mix). She was 3 months bred and pretty thin. I’d guess BCS 2.25. I worked with her through the winter but she wouldn’t gain well and was still under a 3 when she calved twins early June. One calf was still born and the second calf was trampled at a week old and died. At 10 days post delivery, her BCS dropped quickly and now is a 2 or lower. I’m trying to determine the right course for drying her while at the same time trying to keep weight on her. I know I have to get her off feed to dry her, she has access to good pasture and hay. Should I just bite the bullet and get her off feed until dry and then work it back up to get back on feed? You are wanting to dry off a cow that is 10 days fresh? That’s going to be very difficult to do. How much is she milking? I’d recommend milking her for at least a few months before attempting to dry her off, unless she is hardly producing any milk (say, 2 gal a day or less). There’s not a lot you can do about her body condition except to feed her high quality hay or pasture and supplement with some grain (depending again on how much she is milking). Also, having a traumatic calving could have created an infection – if you see signs of infection, please contact your vet to have them come treat the cow. 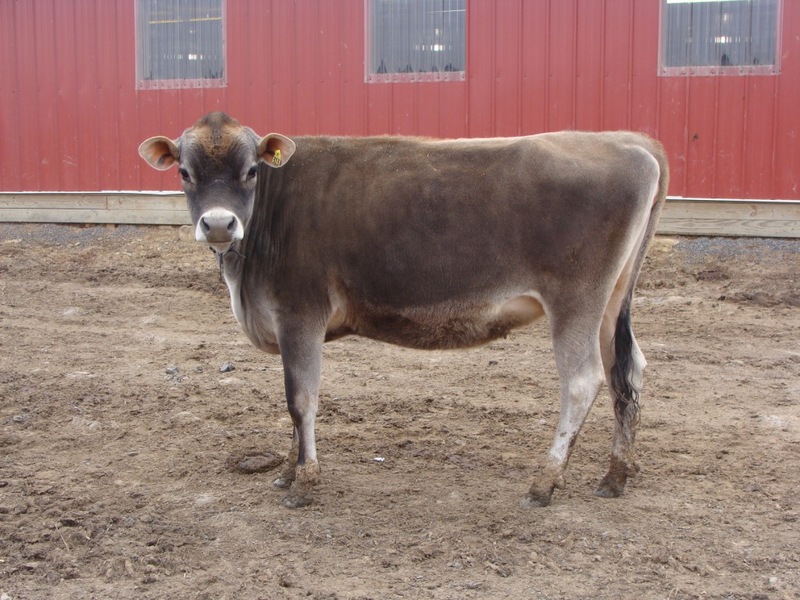 FAQ: We bought a dairy cow and she’s really thin! 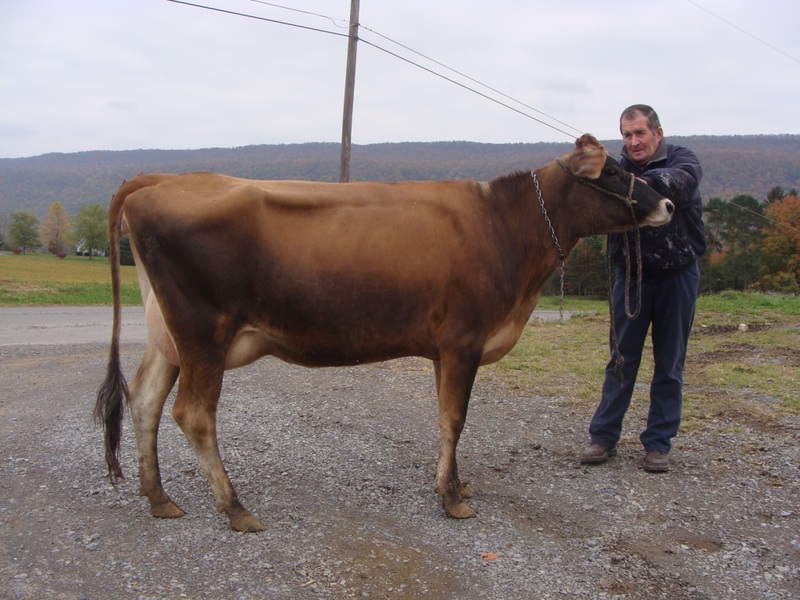 Do you have recommendations on how to help put weight on a newly freshened cow that is getting too thin? She is a high producer. Thanks! You could try a bit lower protein grain (higher carb). Don’t feed too much grain, or she’ll just keep producing too much milk. Try to find a balance where she’s not getting ketosis and not producing too much. 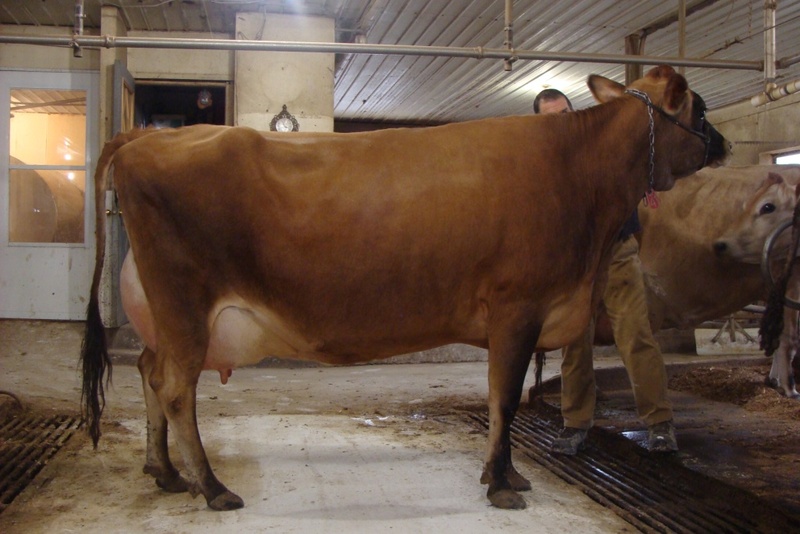 (Depends on how much she’s giving, but in general for a Jersey giving 5-7 gallons, you could do give or take 15 pounds of grain split over two feedings. 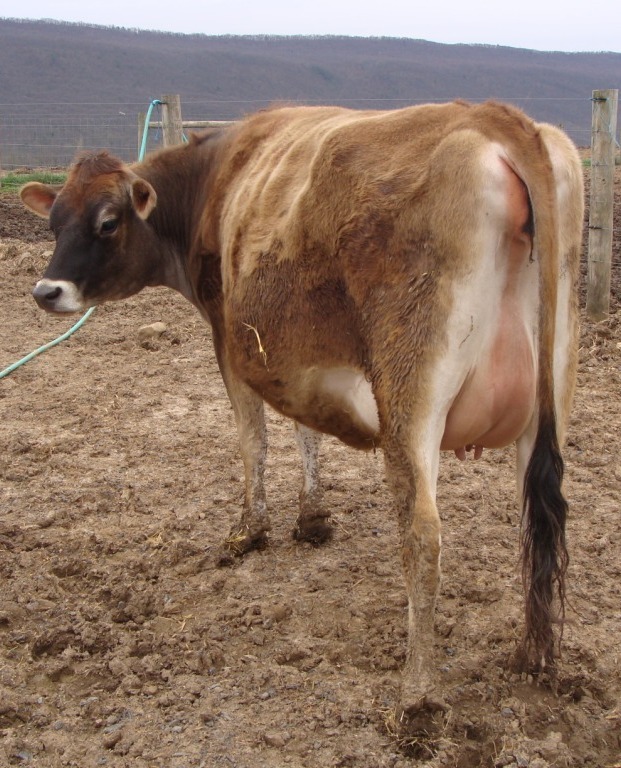 In the long term, it may take her longer to breed back (she’ll need to put some weight on before she’ll breed), and you might want to give her more than 60 days dry period, if she’s still thin toward the end of her lactation. Try to get her to a perfect healthy weight before she calves again, which should help you on the next lactation.